I started to play the mandolin when I was eight years old. Shortly after, I joined the youth mandolin-orchestra, which I played in until I was 18. The first moments of uplifting joy from playing music as “one” for me must have been in this orchestra. I have a fresh memory of the very first rehearsal I attended. The impact of playing in a group together was a surprising new feeling. It’s hard to describe, but I can imagine it’s a bit like a rider and his horse. I know my mandolin very well. My hands remember blindly every curve and every fret of it. I have a deep understanding of how it works, but when I’m on stage it becomes part of me – I almost forget I’m holding it. One of the most formative encounters I’ve had was with the clarinetist and Klezmer giant Giora Feidman, about 12 years ago. A mutual friend arranged for me to meet him. I played him a piece by Ernst Bloch, and when I finished he ordered: “Now improvise”. “I don’t know how to improvise!” I answered, but he just nodded his head and repeated: “Improvise!”. And so I closed my eyes and for the first time in my life I started to play something that wasn’t written in notes. Giora took his clarinet and joined me, and we continued to improvise together for a little while that afternoon. That encounter opened the window to a new world and led me to play different genres of music. I later toured with Giora for a number of years and we became very close. Whenever I’m about to go on stage with one of my world music or jazz projects, which naturally involve improvisation, I remember that moment when he forced me to jump into the pool. I’m in a never-ending process of deepening my understanding of music and improving my skills. For example, I’ve been performing Bach’s Chaconne on-and-off for almost 15 years and every time I go back to it it’s like a new piece to me. Of course, constantly sharpening the technique becomes very helpful when you want to express your musical ideas without compromises. That is indeed one of the every-day challenges. Since quite recently, I have found it extremely useful to read a new piece for the first time only with your eyes, no instrument. It allows me to become familiar with the silhouette of the music; I make a friendly introduction with the score; and then I zoom in. If we both read in a book “Anna stepped down the large staircase into the middle of the room”, we both picture the same situation, but the staircase I imagine is different then yours, so is the room and so is Anna. This is the essence of interpretation. It is the same with music - the freedom of imagination plays an important role, but it comes together with the skills and knowledge of transporting the composer’s message. Music is a universal language and therefore it can play its magic on everyone, without the need of previous knowledge and experience. That said, the cultivating of these last two might help the listeners to amplify their enjoyment, like in every other field. Music is one of the applications of our culture. Italian baroque music, for example, reflects the Italian language, mentality, fashion, aesthetics and even food of its time; at the same time, as stated above, it is a universal language. Let’s say that if music is the language, its different genres are dialects. A performance is a practice that includes not only “playing the music well” but also the art of transmitting the experience to the audience. Therefore, the performance starts way before the first note has been played, I would even say also before the artist has entered the stage, and ends way after the last one. Engaging the audience and creating the right atmosphere in which the music is played is not less important than playing the music itself. The effect of a piece doesn't merely depend on the performance of the musicians, but also on the place it is performed at. How do you see the relationship between location and sound? In how far do you feel the current system of concert halls is still the right one for contemporary music in general? The concert venue is like a synagogue or a church – it accommodates a spiritual experience in which a large group of people (whether fifty people or three thousand is engaged. The architecture of the place, its qualities and its history, are of course all part of the experience and has the power to amplify it (or to make the musician work harder!). As Charles Rosen put, “the death of classical music is perhaps its oldest continuing tradition”. From your perspective, what are some of the root issues for what is generally referred to as the “crisis of classical music”, which also includes the scene for contemporary composition, and what, to you, are sensible ideas for improving it? Classical music is eternal and universal, like all other forms of art. That said, people often confuse “entertainment” and “art”. The first has the power to sustain itself, economically, culturally; while art requires more education. It is extremely important to make art accessible to everyone, as many just don’t initiate contact with it. If everyone on earth had consumed more art, then we would live in a much better world. Music-sharing sites and -blogs as well as a flood of releases and concerts in general are presenting both listeners and artists with challenging questions. What's your view on the value of music today? In what way does the abundance of music change our perception of it? The recording industry is changing rapidly, and has survived several revolutions since its beginning. When the first gramophones appeared people said it would kill the live performance. But I think that as a result of this rapid technological development people hear more music than before. It’s important that we as listeners take responsibility of technology and don’t take advantage by illegally copying music, so the recording industry can survive. Otherwise, we simply kill our own future. Many artists are finding it hard to secure a living with their music. What are the financial realities you're living with and in which way, do you feel, could they be improved? Art in general and specifically classical music has always been supported financially, which has allowed it to grow and develop. Whether it was in the aristocrat courts and kingdoms of 17th century Europe or today’s governments. As mentioned before, bringing art into our lives is an important task and therefore should be part of everyone’s collective interest. I think that social media are changing the way that audiences reach an artist (and vice versa) - more then PR companies. After I play a concert, I always get a couple of messages on Facebook from audience members, telling me what they liked, and from what I post, they know what I like, or what inspires me. That is what brings us closer. A performance is a shared experience. The music is served in a ceremony, called a “concert”, which carries a lot of unwritten codes that both parties practise (and some written codes, like, switch off your phone!). The better this ceremony is practiced, the better the music is delivered. These codes are of course changing (luckily!) with time. 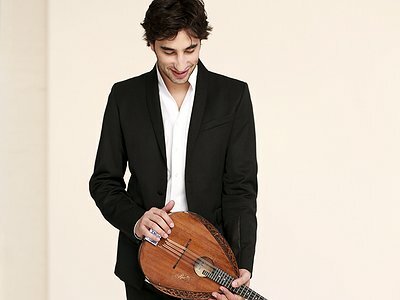 Read more about Avi Avital's latest projects and performances on his website. I've found it useful to read a new piece for the first time only with your eyes, no instrument. I make a friendly introduction with the score - and then I zoom in.